Thunder of Heaven pulls readers into an adrenaline-fueled thriller laced with End Times prophecy. From Tim LaHaye, creator and coauthor of the Left Behind series---the most successful adult fiction series ever written---and Craig Parshall comes an epic story ripped from the headlines of world events and filtered through Scriptural prophecy. Set in the near future, Edge of Apocalypse chronicles the beginning of The End---the earth-shattering events leading up to the Apocalypse foretold in Revelation. 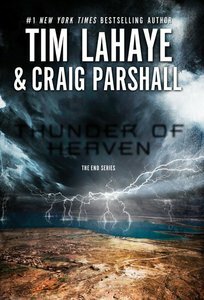 About "Thunder of Heaven (#02 in End Series)"
The End Series by New York Times bestselling author Tim LaHaye and Craig Parshall is an epic thrill ride ripped from today's headlines and filtered through Scriptural prophecy. As world events begin setting the stage for the ?end of days? foretold in Revelation, Joshua Jordan must weigh the personal price he must pay to save the nation he loves. This eBook will appeal to the tens of millions of fans who have already made Tim LaHaye a household name and one of the best selling authors of all time. Thunder of Heaven is a return to form for Tim LaHaye, whose previous prophetic fiction series, Left Behind, has sold roughly 70 million copies. Those who have read Left Behind and who are eager for more highly charged fiction based on biblical prophesies will embrace Thunder of Heaven for the same reasons that turned Left Behind into the world's most celebrated publishing phenomenons of the last two decades. Craig Parshall serves as senior vice-president and general counsel for the National Religious Broadcasters and has authored seven bestseller suspense novels. SPANISH BIO: Craig Parshall sirve como vice presidente y consejero general para la asociacion National Religious Broadcasters y es autor de siete novelas de suspenso bestseller. In the Brink of Chaos, the third book of The End series, corruption in high government offices threatens to block the election of a worthy presidential candidate by all means necessary---including the unthinkable---while Joshua Jordan and his family fight seemingly impossible odds to clear his name and protect the autonomy of the nation of Israel.